Judaism views marriage as the ideal human state. Both the Torah and the Talmud view a man without a wife, or a woman without a husband, as incomplete. This is demonstrated in several passages, one of which states that "A man who does not marry is not a complete person" (Lev. 34a), and another that says, "Any man who has no wife lives without the joy, without blessing, and without goodness" (B. Yev. 62b). Additionally, Judaism considers marriage as holy and, as a sanctification of life. The word kiddushin, which means "sanctification," is used in Jewish literature when referring to marriage. Marriage is seen as a spiritual bonding between two people and as the fulfillment of God's commandment. Furthermore, Judaism perceives marriage as purposeful; the purposes of marriage are both companionship and procreation. According to the Torah, the woman was created because "It is not good for a man to be alone" (Genesis 2:18), but marriage also enables fulfillment of the first commandment to "Be fruitful and multiply" (Gen. 1:28). There is a contractual element to the Jewish view on marriage as well. Judaism views marriage as a contractual agreement between two people with legal rights and obligations. The Ketubah is a physical document which outlines the marital contract. It should be noted that Judaism's elevation of the institution of marriage has contributed greatly to Jewish survival over the generations. Despite the dispersion of Jews throughout the world and the oppression of Jews by other nations, Jews have succeeded to preserve their religious and cultural heritage for thousands of years partly due to the sanctity of marriage and the resulting stability of the family. Jewish law (Halacha) does not require that a rabbi officiates a Jewish wedding ceremony, as the marriage is seen as essentially a private contractual agreement between a man and a woman. Nevertheless, it is common for rabbis to officiate at wedding ceremonies today. 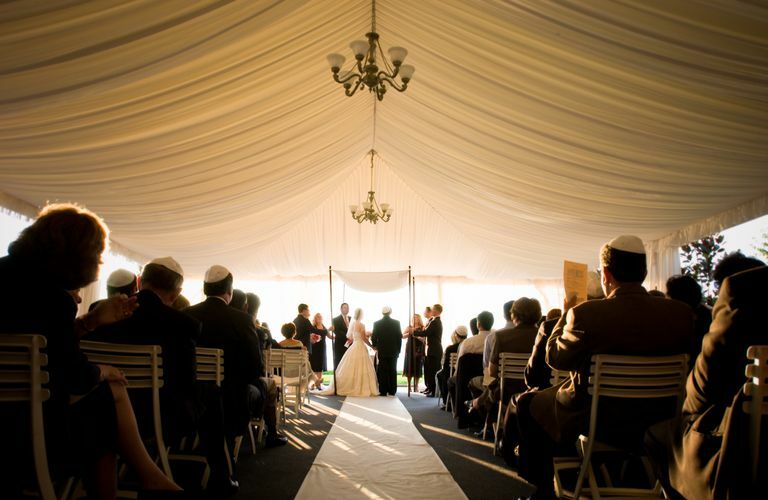 While a rabbi is not mandatory, halacha does require that at least two witnesses, unrelated to the couple, attest that all the aspects of the marriage occurred. The Sabbath prior to the wedding, it has become customary in the synagogue to call the groom up to bless the Torah during prayer services. The groom's blessing of the Torah (aliyah) is called an Aufruf. This custom conveys the hope that Torah will be a guide for the couple in their marriage. It also provides an opportunity for the community, which generally sings "Mazal Tov" and throws candy, to express their excitement about the upcoming wedding. The day of the wedding, it is customary for the bride and groom to fast. They also recite psalms and ask God for forgiveness for their transgressions. Thus the couple enters into their marriage fully cleansed. Before the wedding ceremony itself begins, some grooms will veil the bride in a ceremony called the Badeken. This tradition is based on the Biblical story of Jacob, Rachel, and Leah. Next, the bride and groom are escorted to a marriage canopy called a Chuppah. It is believed that on their wedding day, the bride and groom are like a queen and king. Thus, they should be escorted and not walk alone. Once they are under the Chuppah, the bride circles the groom seven times. Two blessings are then recited over wine: the standard blessing over wine and a blessing related to God's commandments about marriage. Following the blessings, the groom places a ring on the bride's index finger, so that it can be easily witnessed by all guests. As he puts the ring on her finger, the groom says "Be sanctified (mekudeshet) to me with this ring in accordance with the law of Moses and Israel." The exchange of the wedding ring is the heart of the wedding ceremony, the point at which the couple is considered to be married. The Ketubah is then read out loud for all of the attendees to hear, as well. The groom gives the Ketubah to the bride and the bride accepts, thus sealing the contractual agreement between them. It is customary to conclude the wedding ceremony with the recitation of the Seven Blessings (Sheva Brachot), which acknowledge God as the creator of happiness, human beings, the bride and the groom. After the blessings have been recited, the couple drinks wine from a glass, and then the groom breaks the glass with his right foot. Immediately following the Chuppah, the married couple goes to a private room (Heder Yichud) to break their fast. Going to the private room is a symbolic consummation of the marriage as if the husband is bringing the wife into his home. It is traditional at this point for the bride and groom to join their wedding guests for a festive meal with music and dancing. There is no civil marriage in Israel. Thus all marriages between Jews in Israel are conducted according to Orthodox Judaism. Many secular Israelis travel abroad to have civil marriages outside of the state. While these marriages are legally binding in Israel, the rabbinate does not recognize them as Jewish marriages.